I definitely heard Him say that, when I was just two weeks away from flying to Tanzania for a months ministry. The idea was both exciting and yet ridiculous….so uneconomical and anyway I had a programme in Tanzania to fulfill which had already been arranged. But then I remembered God’s admonition to Isaiah to strip naked and live like that prophesying, for a full three years. 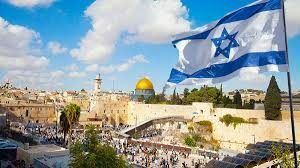 I realised I had been let off lightly and Israel….well who would love to go to Israel if only for one whole day. Again I heard the Lord say…” I have some prophetic action for you to do both in Jerusalem and in Jaffa in Tel Aviv. Take your shofar and blow in both cities. 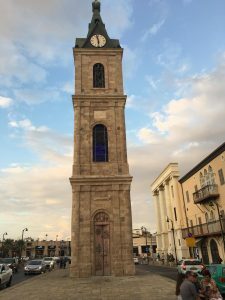 In Jerusalem at a ‘high place that I will show you’ and under the Jaffa Clock Tower in Tel Aviv before you fly back to Dar Es Salaam, Tanzania, to finish your assignment there. Make prophetic declaration over the nation just as you did in Westminster London, in Naorobi Kenya, in Penang and Kaula Lumpur Malaysia and Dodoma in Tanzania. 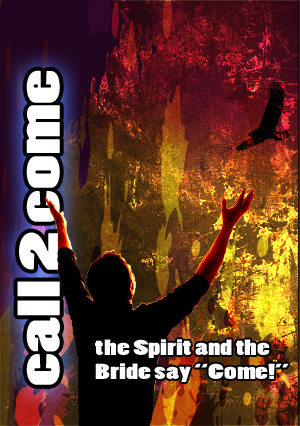 Bring alignment of the Times and Seasons of Israel with the Times and Seasons of Heaven”. At this point my cerebral was switched off and I chose to believe. I would GO! Immediately I received a contact from a Christian brother in a foreign nation who on hearing this story offered there and then to cover the expenses of the whole assignment. When God proposes ….He provides. So it was that I interrupted my Tanzania programme and left Dodoma a day earlier in my schedule to take the 10 hour bus ride to Dar Es Salaam Airport and fly around 10 pm on the evening of 8th October to Tel Aviv Israel arriving around 4 am on Monday 9th October 2017. I would do what Yeshua had commanded and then fly back to Dar Es Salaam overnight again on the 9th arriving back in time for the next conference planned for Dar Es Salaam on the 10th. I was able to make arrangements in the two weeks before I left the UK to have a meeting with Tom and Kate Hess of the JHOPFAN in Jerusalem and so having arrived very early at Tel Aviv Airport I took the next airport shuttle bus to Jerusalem and made my way to where the Arab taxis parked and found one that would take me to the House of Prayer (JHOP). 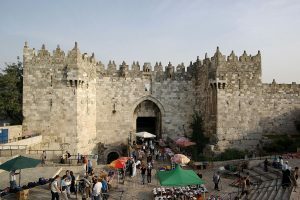 We went past the Damascus gate and up towards the Mount of Olives and the Garden of Gethsemane towards Tom Hess’s house near the Jerusalem House of Prayer. 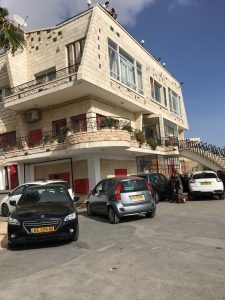 The Arab driver was so helpful but could not find our destination so I got out and made my way on foot to Tom Hess’s house only to find no one around at that time of the morning. But God had arranged everything and Tom was to pass by in his car within minutes and so arranged for the HOP warden to come and collect me. This wonderful man was a converted Arab who just loved the Lord so much and oversaw many of the day to day arrangements of the Prayer Centre…..he also is the excellent chef who provides the delicious food for the myriad of students who come regularly from all over the world. They come for training in intercession and keep the non stop prayer watches throughout each day, month and year. We soon arrived at the JHOP. A “high place that I will show you” was what Yeshua had said and as I drove up to the JHOPFAN I realised that this was indeed the very place for the building is set on the hill overlooking the Kidron Valley with the City of David to its right and the hills in front and to the left, stretching out all the way to the Dead Sea. At the very top of the building is the Prayer Tower where the intercession and the watches take place. This was the perfect place to do what He had commanded me to do. It was then that I also realised that I actually was in Jerusalem for the Feast of Tabernacles, the Feast that all followers of the YHWH and His Messiah are commanded to observe in Jerusalem….. Zech 14 v 16. This was an unexpected joy to me. Although I wouldn’t see the march through Jerusalem which would take place few days later of thousands of Christians marching from many many nations marching in support of Israel….it was a great delight to me to realise that I was actually in Jerusalem at this Feast. I spent the morning with Kate at JHOP who has just released her book called The Warrior Bride ….yes we had so much in common and enjoyed sharing similar journeys and revelations…. and I spent some of the afternoon with Tom. I had a chance to sit in on one of his seminars on Intercession. It was great and I was blessed. I then went up to the Prayer Tower to join the late afternoon Prayer Watch to do what I had come for. It was a wonderful moment and the leader and those at the watch graciously asked me to share what I had come for and the circumstances leading up to being there that day. They whole heartedly embrace both myself and the Prophetic Action that then took place. I was so encouraged. Having done that, within the hour I was on the road travelling back towards Jaffa in old Tel Aviv where I had arranged to meet some of the shofar players from Malaysia (where I had been a few months previously) and shofar players from other nation, all of whom had come to Jerusalem for the Convocation and the Feast of Tabernacles. 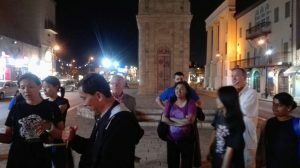 Despite the challenges of meeting each other we met at the Jaffa Clock Tower on time and blow the shofar and made our prophetic declarations regarding the times and seasons. This was an historic occasion since this year 2017 marked the centenary anniversary of the signing of the Balfour Agreement which the British had brokered but which had not completely followed through. I needed to repent of any default on behalf of the British Government first before we could celebrate and prophesy. This I did publicly. It was also the 500th Anniversary of the beginnings of the Reformation and the 50th anniversary of the reunification of Jerusalem in 1967. …and much more. The Lord had said that at this assignment there was to be members of the British nation, the Jewish nation and those nations from the Golden Gate sector of the World Prayer Watch like Malaysia. We had present two Jewish Christian brothers from Jerusalem and several other nations from this sector represented. 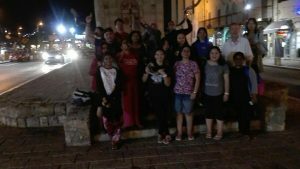 About twenty of us had assembled at the Clock Tower most with shofars. It was an awesome sound as the shofars blew out their haunting sound and then we prophesied and called upon Israel and warned her not to miss ‘this day of her visitation’ as she did when Messiah first came but to heed the hour. Big Ben referred to in this next video clip is the famous clock Tower in London UK from which the nations of the world get their time. Big Ben itself is regulated from the Greewich Observatory in Greenwich London England. The worlds time is set by this Observatory and Big Bens is the first clock to regiater that time. From there all nations time is set ….as Greewich Meantime +1 or +2 or +3 and -1 or -2 or -3. etc. We first declared the Time and Season of the Bride below Big Ben on Westminster Bridge London in Nov 2016 by blowing the shofar and prophesying as the Lord led us to do. From that day on we have been led to do the same in many other nations. Having done this I bade everyone goodbye, with a slight feeling of sorrow in my heart, and headed off for the airport and back to Tanzania.